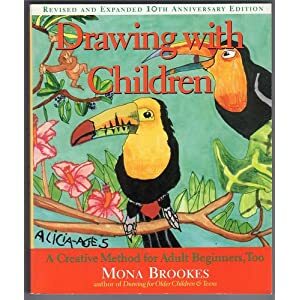 I’m excited to start the very popular Drawing with Children book by Mona Brookes. Although we’ve had this book for a while already, I finally prepared myself to follow it. Brookes’ drawing book is very widely known around homeschooling circles for teaching even the youngest of children to draw realistically and quite charmingly. Her book, nevertheless, is not one you just open up and go. Some say its format is simply too ‘unfriendly’ to bother following. Indeed, it took me a good 10 months or so since I bought it to finally get around to it. I made sure I have read all the notes, preliminaries, and recommendations to create a fun and supportive environment for us budding artists, and so Super Hero and I are ready to begin! We’re both really excited that we will be learning together. We are looking forward to continuing with our drawing lessons and see how much better artists we become 😉 If you would like to join us in learning to draw, I will be posting here all (or hopefully all) that you need to sit with your child and follow the book along. My intention is to make Mona Brookes’ lessons more instructor-friendly. They are actually not that hard to follow at all, it just requires some more prepping than what I’m used to. Although it was almost clear by reading this chapter that Super Hero (just turned 7) would be level 2 and I would be level 3, I still wanted us to do these exercises and get a feel for what is to come. So we did. They were short, quick and simple enough and have gotten us in our way.